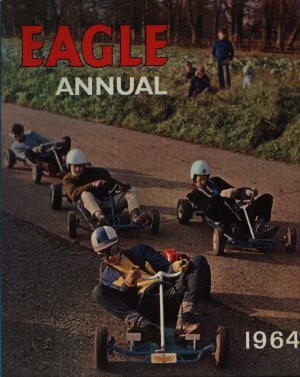 Eagle Annual 1964 has a new publisher again but this time has no named editor. Gone are the red covers with the green cloth spine, replaced by a fully glossy combined printed spine and cover. Engineering disappears from the contents, replaced by more stories but other than that, the format and contents remain as previous years. Find out if You Can Catch a Crook?